I invited my sister to do a guest post about a new knitting magazine that she spotted, as I have not seen it yet. There is also a crochet one. 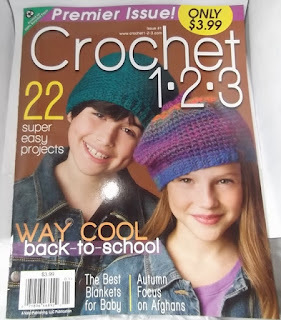 Since my sister both knits and crochets, she bought and wrote about both the magazines. I don’t normally look at the yarn when I am in Wal Mart because, quite frankly, 99% of what they sell is not to my liking and usually what few yarns they have that I might like well enough to use there’s always something that will prevent me from buying it. (Tangled up skeins, or FILTHY ones that look like they’ve been run over by a car a few times, things like that.) So I tend to just not even look. But today I decided to stroll down that aisle just for the heck of it. Once I got to the end of the aisle, I happened to spot a couple new magazines – one for knitting and one for crochet. I simply assumed new issues of magazines I’m familiar with. But nope. These are actually BRAND new magazines, the first issues! So, I had to get them. Don’t give me that look. Both magazines have the same format. 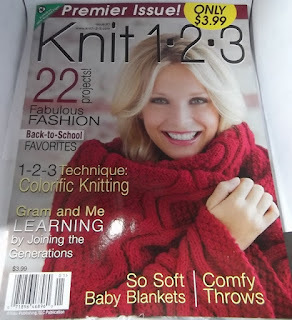 There’s a review section that gives short reviews of new knit/crochet books, yarns, notions etc., there are a couple articles and of course, patterns. I love that the ads are minimal in these. There are 23 patterns and 3 articles in Knitting 1-2-3, and Crochet 1-2-3 contains 24 patterns and 3 articles. Knitting 1-2-3 contains an article on adding color to your knitting in three different ways: stripes, 2-color slip stitch and fair isle. There is a series of articles called Gram & Me, and it’s about the author’s time with a granddaughter teaching her to knit. In Crochet 1-2-3, there is an article on crocheting in the round and then the same author of Gram & Me has a series with her granddaughter and crocheting titled Gram’s Hands. The third article in both magazines is an article about knitting (or crocheting) for charity, specifically for an organization called Warm Up America. The web sites for the magazines are knit-1-2-3.com and crochet1-2-3.com (appropriately enough eh?) although the sites are small as can be expected from a brand new publication, they will grow quickly I am sure. The knitting one is not totally live just yet actually, but I would imagine it should be fully functional within the next few days. The release date on both magazines September 18th, though as is evidenced by my purchase, you might be able to find them now. I was the first one to buy these from my Wal Mart. I know because I had to open up the plastic wrapper on both stacks of magazines to get to them! As you can see in the pictures, they are $4 each. If you subscribe, a one year subscription costs $13. This will be for six issues, as new issues of these magazines will be released every other month. I’m giving serious thought to subscribing to both! Both of these magazines are available exclusively at Wal Mart. Or you can visit their web sites to subscribe. Again, Knit1-2-3.com is not currently fully functional but Crochet1-2-3.com is. I have no idea why one’s up and running and the other is just a ‘preview’ type page. But I am sure that within a couple days both sites will be fully functional and you’ll be able to subscribe to either magazine through their respective web sites. Oh. And if you’re wondering… yes. Yes I do want to make several of the patterns from each of these magazines now. Oh you are so lucky...my Wal-mart doesn't have these....I guess they sold out. I know this is an old post but it seems enough Walmart shoppers didn't buy this, or people didn't subscribe - perhaps for the same reasons they don't shop there. I only just learned about these magazines on Ravelry, with a lovely girl's hooded cape. Likely I'll never find the magazine issue it came from but I will try to get it on Ebay. They have even taken down the website for each. Too bad it was Walmart related.